The Mystery of the Holy Spirit, by R.C. Sproul, takes an up close look at the third and sometimes forgotten member of the Trinity: the Holy Spirit. There is a lot of confusion about Him, and misconceptions abound. In this book, R.C. Sproul writes excellent theological teaching that is fully backed by Scripture. It’s an excellent place to begin learning more about the Holy Spirit. The book’s content loosely divides into three main chunks. 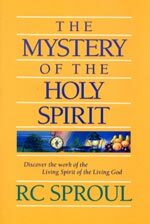 In the first few chapters, Sproul just takes a look at who exactly the Holy Spirit is. It’s surprising what just a careful perusal of the Bible brings to light immediately. Sproul brings up many misconceptions which people hold about the Holy Spirit, and from there goes on to prove that the Holy Spirit is in fact God. Inevitably, a discussion on deity will bring about the concept of the Trinity. Sproul looks at the Trinity in the context of the Holy Spirit, and moves to debunk the misconceptions that the Holy Spirit is a mere extension of the Father and Son. Sproul then goes on to explain the Spirit’s unique role within the Trinity. These chapters end up forming the real backbone of the book. The chapter on the Holy Spirit in Creation is especially excellent. We are then taken to the Holy Spirit’s role in our own lives, in the here and now of day-to-day life. We look through the Spirit-filled baptism, the fruit of the Spirit, and the Spirit’s role as Comforter. An upclose look at the true meaning of Comforter is especially helpful. Overally, I’ve never read a book on the Holy Spirit that says so much in so compact a form. Sproul really hammers the big points and leaves you wanting to dig deeper into the subject. I very highly recommend this book as a jumping-off point for your studies on the Holy Spirit, which is why I originally purchased the book myself. R.C. Sproul’s writing really is excellent – this book is well worth the time it takes to get through it.